Applications: Food service and healthcare industries. 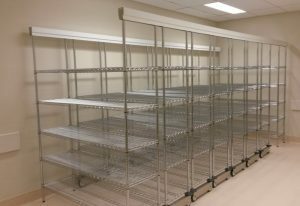 Wire Shelving is ideal for applications where a sterile environment is a requirement. Shelves are manufactured from wire preventing the build-up of dust that can harbor bacteria and germs and allow air to circulate over stored items. Shelves can be easily adjusted at 51mm vertical increments with minimal tools using the unique “lock in” wedges. Wire Shelving cane be in stand-alone static bays, fitted with castors for mobility or configured in bays with an overhead guide track and castors as a “COMPACTOR”. A range of accessories is available to segregate items on the shelves including Bin Fronts (Front & Rear) & Dividers, Trolley Handles, Label Holders and Castor Kits. Wire Shelving is ideal for applications in Food Service where a sterile environment is a requirement. Posts and shelves are manufactured steel with Epoxy Coated finish with Microban Antibacterial coating, preventing the build-up of dust that can harbor bacteria and germs and allow air to circulate over stored items. Polymer open grid shelf mats with Microban antibacterial protection can also be supplied where resistance to abrasion or sharp edges of stored items is required. These mats are suitable for either hand or machine washing. Shelves can be easily adjusted at 51mm vertical increments with minimal tools using the unique “lock in” wedges. Cool Room Shelving cane be in stand-alone static bays or fitted with castors for mobility. Finish: Epoxy Coated with Microban Antibacterial coating.